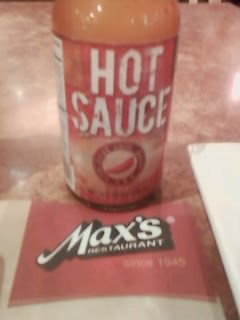 I simply cannot forget a simple product as this hot sauce of Max's Restaurant. It may look an ordinary condiment but this made me cry. I was alone, so homesick, missing my kid then. I went to the restaurant to eat in a not-in-a-hurry pace. I chose Max's restaurant because I can sit well without worrying if others will be wait-listed. I don't have to hurry and worry even because crew are friendly and accommodating. While eating, a kid in a table next to me approached me. She looked older than my girl. She waved to me and said, "hi!" I replied in my most polite way of saying "hello!" The girl reminded me of my homesickness. I can't continue swallowing the food. She reminded me of the hot sauce in front of me. Hot sauce reminds me of home. At home, we usually to eat spicy foods. We include chili in our menu. We plant "labuyo" in the yard and we love to include them in our meals. That makes a simple hot sauce in front of me important. It reminds me of something. It reminds me of my kid who is so far away from me. It reminds me of home. Why Do I Eat in Jollibee?